In the first game of their Canadian tour, Alabama overcame a sluggish start to beat McGill by a final of 96-57. 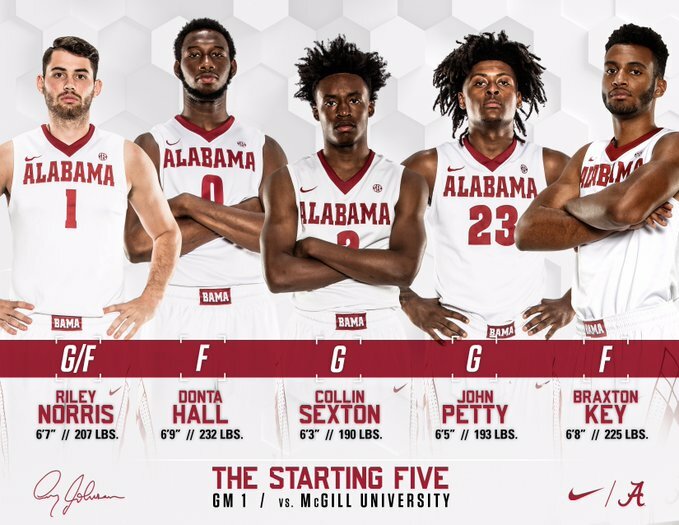 Freshman John Petty had an explosive first game in an Alabama uniform, scoring 22 points on 8-10 (6-8 from 3) shooting. Petty also added 5 rebounds. Ar'Mond Davis added 14 points (4-6 from the field, 2-4 from 3, 4-5 from the free throw line), while Collin Sexton and Daniel Giddens scored 13 points in their debuts. Dazon Ingram sat out the game due to a minor foot injury. He will likely not suit up for the remaining games in Canada, but is expected at full strength by the time we reach November. Criticisms: 1] Too many turnovers. The final box score showed 28 turnovers for Alabama. Sloppiness is to be expected in a game played in August, but the 2nd half in particular, the team was really sloppy with the ball. 2] Braxton Key and John Petty led the team in rebounding with 5 each. I would like to see our big guys (Donta, Daniel and Galin) more active on the glass, particularly against this level of competition. 3] Free throw shooting was up and down. The team finished with a 60% rate (14-23). Turnovers and free throw shooting were two of the biggest weaknesses for Avery's first two teams. That needs to improve in year three. DJC was in Montreal. Expect a much more in-depth recap from him in the coming days. Alabama will now travel to Ottawa for their final two games. Our guys play Carleton University on Wednesday night. Game time is 6 PM C.T. There is no stream currently available for that game.